This final installment based on the Report, Diversity Within Diversity: The Varied Experiences Of Asian And Asian American Law Students, highlights findings related to the law student experience. LSSSE asks respondents about how they spend their time, in the context of their studies and beyond. Employment can be a very useful part of the law school experience if it has relevance to the practice or study of law. Some employment, however, is motivated by necessity, and not necessarily a desire to foster one’s professional development. LSSSE respondents are asked to stipulate whether employment is law related or non-law-related. Among the six subgroups, Vietnamese respondents were most likely to report being employed, with the disproportions being particularly apparent in non-law-related jobs. They were also most likely to report working eight or more hours per week in either setting. The relatively high proportions of employment, particularly in non-law-related jobs, raises questions about the role of financial pressures among Vietnamese law students. 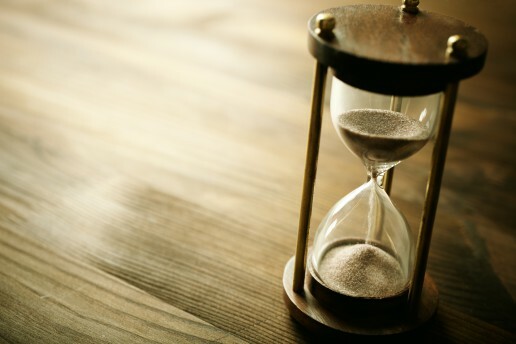 Vietnamese respondents were also most likely to report spending time providing care to dependents residing in the same household, with Vietnamese and Japanese respondents reporting the largest time commitment. Vietnamese respondents were least likely to report feeling as if their law school helped them cope with their nonacademic responsibilities. Asian respondents overwhelmingly reported favorable relationships within their law school, but Vietnamese respondents were noticeably more likely to state that other students were “unfriendly and unsupportive.” Korean respondents had the least favorable perceptions of their professors, with less than half harboring the most intensely positive feelings. Vietnamese respondents were least likely to report feeling as if they were acquiring a broad legal education, with one-in-5 expressing an unfavorable perception. In that vein, almost one-quarter rated their law school experiences fair or poor, again the highest proportion. Interestingly, given these perceptions, 86% of Vietnamese respondents stated that they would probably or definitely attend the same law school again, if given the benefit of hindsight. Only Japanese respondents had a higher proportion expressing this ostensibly favorable assessment. On the other hand, Korean respondents were least likely to state that they would attend the same law school again, with 1-in-4 stating expressing regret. The experiences of Asian subgroups within the LSSSE pool varied, belying the prevailing assumptions about the Asian monolith. Their backgrounds, informed in large part by immigration patterns, differed markedly. There were vast disparities in expected law school debt. There were differences in how they spent their time, and how they perceived the law school experience. In the end, the distinctive aspects of each group manifested. 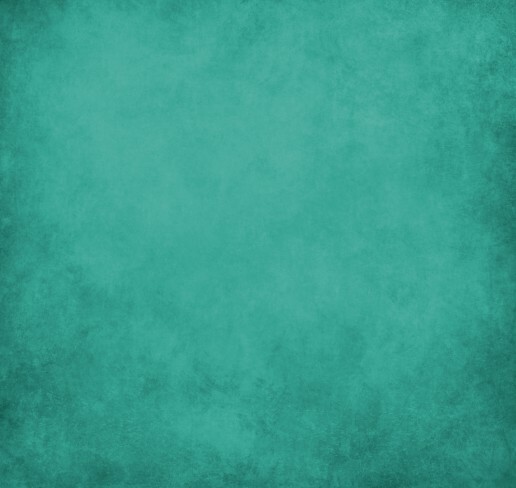 As law schools work to ensure that their programs benefit all students, the experiences of subgroups within our broad classifications (racial/ethnic and others) should also be considered. This second installment based on the Report, Diversity Within Diversity: The Varied Experiences Of Asian And Asian American Law Students, highlights findings related to scholarships and student loan debt. 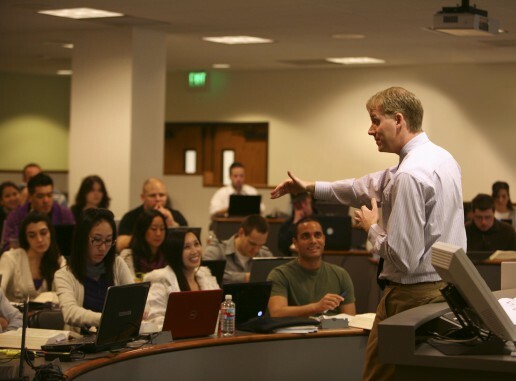 Given the outsized role that the LSAT plays in determining who goes to law school, where they go, and how much they pay, the trends suggest that Filipino and Vietnamese applicants are much less likely to gain admission and less likely to receive lucrative scholarships, even if they receive an admission offer. 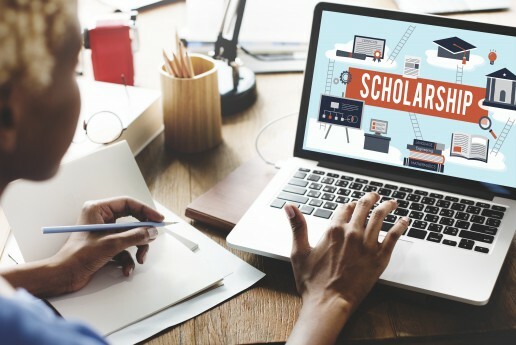 As explained in the LSSSE report, Law School Scholarship Policies: Engines of Inequity, the overall trends routinely highlight a strong link between LSAT score and receipt of so-called merit scholarships. But those linkages were not observed as strongly among the Asian subgroups. Sixty-five percent (65%) of Vietnamese respondents reported receiving merit scholarships, the highest proportion, along with Japanese respondents. LSAT score differences suggest that Chinese respondents would have received these scholarships in the highest proportions; but their rate of 57% was tied with Filipino respondents. International students are sometimes ineligible to receive merit scholarships awarded by law schools. But immigrant status does not explain why receipt of merit scholarships (from all sources) among Chinese respondents seemed depressed. Chinese immigrants were only slightly less likely to report having received a merit scholarship of some type than Chinese Americans – 55% vs. 56%. For many reasons, the LSAT score should not be the primary determinant of who gets a merit scholarship; but it commonly is. Therefore, the trends among Asian respondents are somewhat of a riddle. The need-based scholarship awarding trends took a more predictable track, with Filipino respondents (27%) mostly likely to have received this aid, followed by Vietnamese respondents (23%). Chinese respondents (13%) were least likely to report receiving this aid, a possible artifact of the high proportion of international students. The LSSSE Survey asks respondents to estimate the amount of debt they expect to incur from law school. Half of Chinese respondents expected no law school debt – the highest proportion. Once again, this trend can be explained by the high proportion of international students among the Chinese subgroup. International students do not qualify for U.S. government student loans and, therefore, are much less likely to report expecting student loan debt. 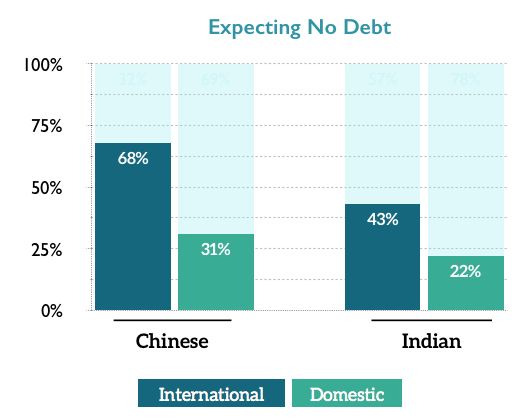 Among Chinese and Indian respondents, international students were more than twice as likely to expect no student loan debt than domestic students. Less than 10% of Filipino and Vietnamese respondents expected to leave law school debt-free. Half of Filipinos expected to owe more than $120,000, compared to 15% of Chinese respondents. And at the highest end of the spectrum, Filipinos were about seven times as likely to expect more than $200,000 in law school debt than Chinese respondents, 14% to 2%. This is the first installment in a series based on data from the 2016 LSSSE survey administration and the LSSSE Report, Diversity Within Diversity: The Varied Experiences Of Asian And Asian American Law Students. In 2016, LSSSE, for the first time, asked respondents identifying as Asian or Hispanic/Latino to also identify an ethnic subgroup. This report presents various disaggregated data for the Asian subgroups. The data presented in this Report comes from the LSSSE Survey responses of more than 16,000 students at 67 U.S. law schools. 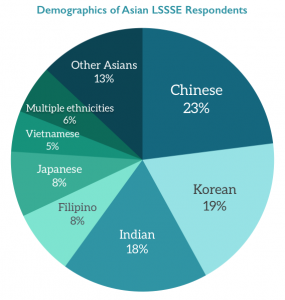 A total of 1,147 LSSSE respondents identified as Asian, comprising 7% of the LSSSE pool – and about 1-in-7 of all Asian law students in the United States. Chinese respondents were the largest Asian subgroup (23%), followed by Koreans (19%) and Indians (18%). There were six subgroups that comprised at least 5% of the pool of Asian respondents. Comprising 81% of all Asian respondents, this report will center on these six groups. About 6% of respondents identified with multiple Asian subgroups or with an Asian subgroup and another race; their data is excluded from the subgroup analyses, as are data for respondents who identified with groups comprising less than 5% of the pool. The data presented in this report provide a glimpse into the experiences of these law students over the course of one school year. Socioeconomics loom large in the ascent to law school, and law students tend to be a relatively affluent group. The LSSSE Survey attempts to get a sense of the socioeconomic backgrounds of respondents by asking about the education levels of their parents. Researchers often use parental education as a proxy for socioeconomic status. The linkages between higher education and income dictate that students with college-educated parents tend to come from more affluent backgrounds. Respondents with at least one parent possessing a BA/BS or higher comprised more than 75% of each subgroup, with one glaring exception: Vietnamese respondents. Only 41% of Vietnamese respondents had at least one parent with a BA/BS or higher. Put the other way, about 6-in-10 Vietnamese respondents were among the first-generation in their family to graduate from college. These trends align with the overall educational attainment figures cited earlier, and can be explained in large part by different immigration histories and patterns among groups. Half of Chinese respondents reported being international students. This was the highest proportion by far; the second-highest being among Indian respondents (24%). The lowest proportion (1%) was among Filipino respondents. This is the third installment in a series of five posts based on data from the 2016 LSSSE survey administration and the 2016 Annual Report. The LSSSE 2016 Annual Report highlights inequities in scholarship policies and the associated consequences for student loan debt. Equity is often assumed to be the same as equality, but they are different. Equity accounts for differences in ways that equality does not. In fact, the insensitivity of equality-based frameworks can exacerbate inequity through a dichotomous compounding of privilege and disadvantage. Merit scholarship programs provide a classic example of this phenomenon. Merit scholarships tend to be awarded through equality frameworks, in which similar criteria are applied to all applicants. These criteria most often revolve around standardized test scores and other factors that track closely to non-merit indicators, such as socioeconomic status. In the end, wealth and privilege become proxies for merit, a conflation that results in financial windfalls and further advantages for applicants least in need of such assistance. The debt burden is highest among respondents for whom neither parent has more than a high school diploma. 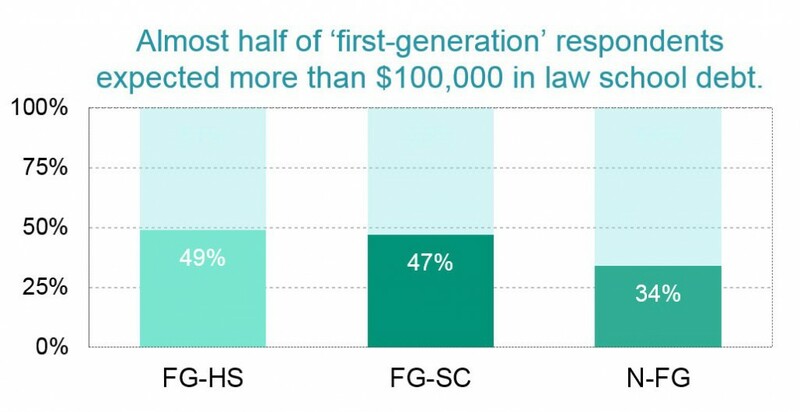 Almost half of these “first-generation” respondents (FG-HS) expected to owe more than $100,000, compared to 34% to non-first-generation (N-FG) respondents. The question is often posed: Why shouldn’t the LSAT be a primary criterion for determining who gains admission to law school and who receives scholarships? The most basic answer to this question is that the LSAT is designed to be a predictor of first-year law school performance and, in fact, explains roughly 38% of the variance in first-year law school grades. But the LSAT is even less reliable in predicting longer-term outcomes, such as bar exam performance and career success. Despite these limitations, the LSAT remains a central factor in most admissions and scholarship awarding decisions. It is an unfortunate and uncomfortable truth that a large number of admissions and merit scholarship decisions are rooted in a fundamental misuse of the LSAT. The heavy reliance on LSAT scores to award scholarship money exacerbates disadvantages based on privilege by distributing resources inequitably. 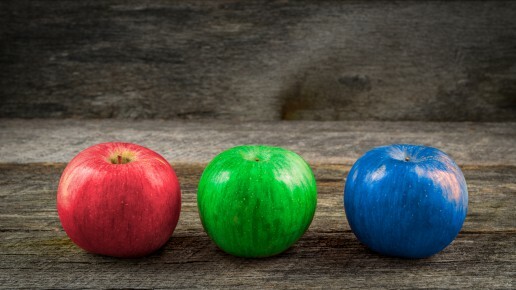 Equity requires that we encourage the success of all our students by appreciating their differences and meeting their needs to the extent possible. In our next post in this series, we will show some interesting associations between the type of scholarship students receive and their expected student loan debt levels. This is the second installment in a series of five posts based on data from the 2016 LSSSE survey administration and the 2016 Annual Report. The LSSSE 2016 Annual Report highlights inequities in scholarship policies and the associated consequences for student loan debt. In this post, we examine whether the financial costs of a legal education reinforce or mitigate larger societal inequities based on race and ethnicity. Equity is important given the risks involved with attending law school. If scholarships are awarded to students with the most financial need, these students could attend law school with less financial stress and less reliance on student loans. The aid would, in turn, minimize risks among students for whom law school is already riskiest. Unfortunately, based on the LSSSE Survey data, law school scholarships flow most generously to students with the least financial need and least generously to those with the most need. The income and wealth inequalities that plague our society foster vast disparities in student loan debt among people with similar levels of education. 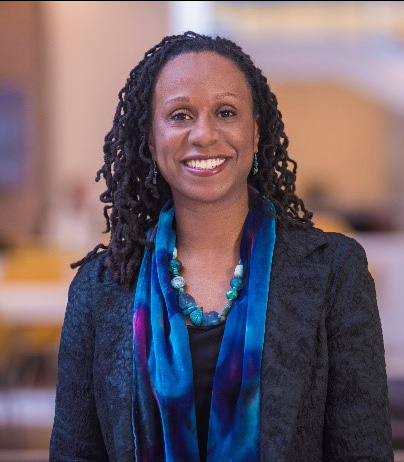 According to the Brookings Institution, “black college graduates owe $7,400 more [in student debt] on average than their white peers.” Four years after graduation, this gap balloons to $25,000, due to differences in interest accrual and graduate school borrowing. LSSSE data align with these findings. Fifty-three percent of black respondents and 57% of Latino respondents expected to owe more than $100,000 in law school debt upon graduation, compared to 38% of white and 40% of Asian respondents. As the Brookings data illustrate, higher interest accrual on higher debts will likely exacerbate these already yawning disparities over time. The close correspondence between LSAT scores and merit scholarships fostered racial and socioeconomic disparities. White and Asian respondents were most likely to have received a merit scholarship. Black and Latino respondents were least likely. 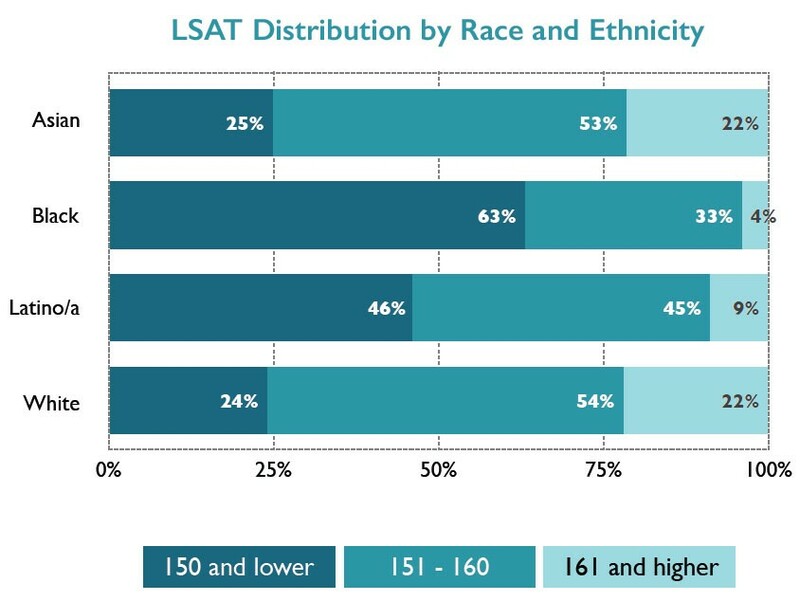 The underlying reason for this disparity is that LSAT scores among blacks and Latinos tend to be lower than those of whites and Asians. 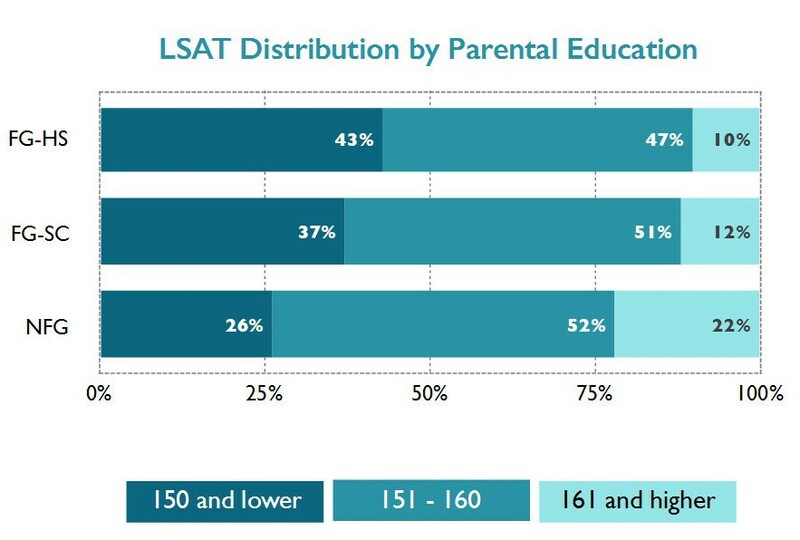 In the LSSSE sample, 63% of black respondents and 46% of Latino respondents had LSAT scores below the rough national median of 151. Only about a quarter of white and Asian respondents had scores below 151. At the other end of the distribution, where scholarship money flows most abundantly, 22% of white and Asian respondents scored above 160, while only 4% of black and 9% of Latino respondents scored at that level. In our next post, we will highlight some differences in scholarship and debt patterns among students from different socioeconomic backgrounds and expand on why heavy reliance on LSAT scores to allocate scholarship funding may be deeply problematic for those who value equity in education. This is the first installment in a series of five posts based on data from the 2016 LSSSE survey administration and the 2016 Annual Report. The LSSSE 2016 Annual Report highlights inequities in scholarship policies and the associated consequences for student loan debt. 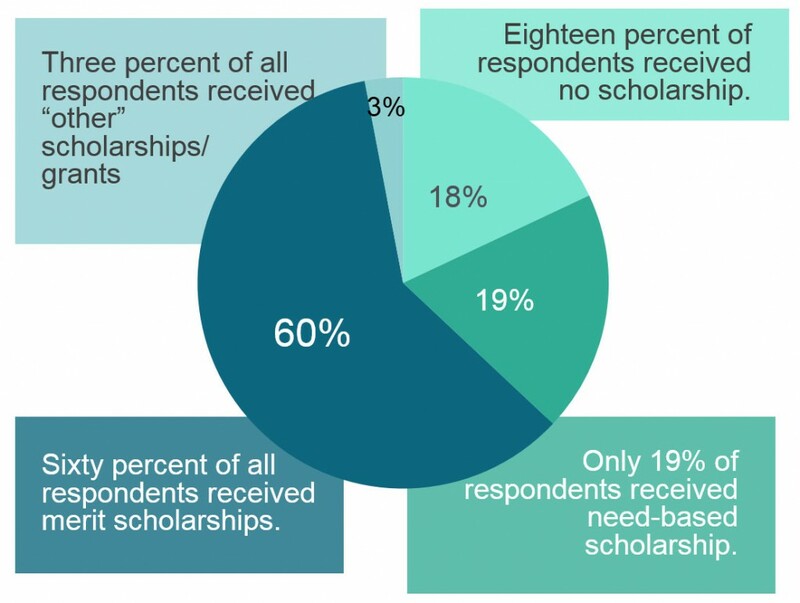 In this post, we summarize the overall prevalence of merit-based and need-based scholarships reported by LSSSE respondents. 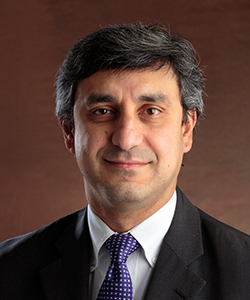 The cost of legal education is a topic of considerable interest. Discussions tend to revolve around ever-rising tuition sticker prices. The truth, however, is that relatively few students actually pay sticker price for their legal education. The downturn in law school applications and enrollments has prompted schools to rely more heavily on tuition discounts – mainly, scholarships – as a means of attracting students. Over 70% of the law students surveyed by LSSSE in 2016 reported having received scholarships for their studies – a proportion that would have been unimaginable a decade ago. By forcing schools to be more generous in awarding scholarships, the decreased demand for legal education has been a bright spot for many students. Merit scholarship funding makes up the bulk of law school scholarship budgets. American Bar Association data show a vast expansion of merit scholarship funding between 2005 and 2010, and while more current data are limited, all indications are that this trend has continued and likely intensified since that time. Need-based funding, on the other hand, has remained essentially flat. 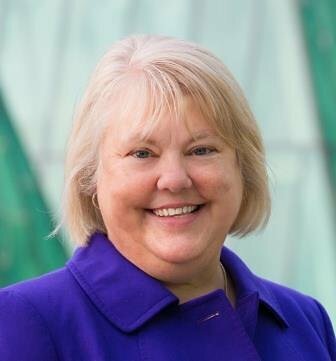 Funding for so-called “need-plus” scholarships increased markedly. These awards are, in theory, need/merit hybrids. Nevertheless, indirect trends suggest these scholarships have little equitable impact, operating as merit scholarships by another name. 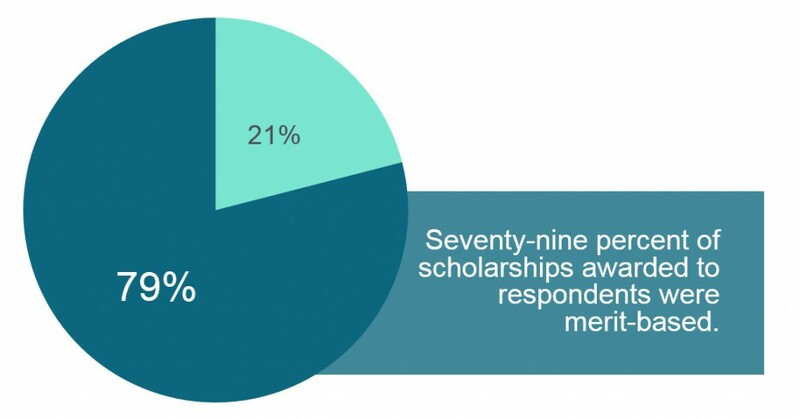 Among those respondents who reported receiving a scholarship, 79% of the scholarships were merit-based. Only 21% of the scholarships were need-based. 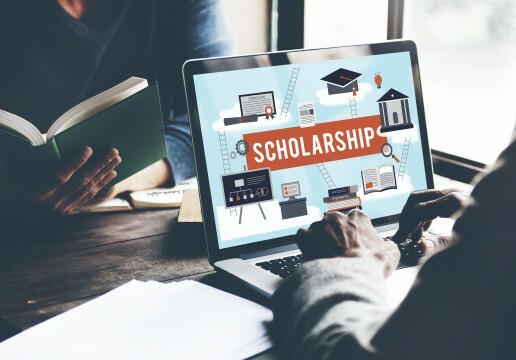 Although the LSSSE data does not capture the dollar amounts of these scholarships, it is clear that law school scholarship policies heavily emphasize merit without regard for differences among students based on background or economic need. In our next two posts, we will discuss some general differences in student demographics between recipients of merit- and need-based scholarships. The topic of law student stress has garnered increased attention in legal education. Given the prominence of this issue, LSSSE created a 9-question Law Student Stress Module that was appended to the core survey and administered to a subset of students at 13 law schools. The module gathered 3,716 responses that provide interesting insights into this under-researched but central aspect of the law student experience. 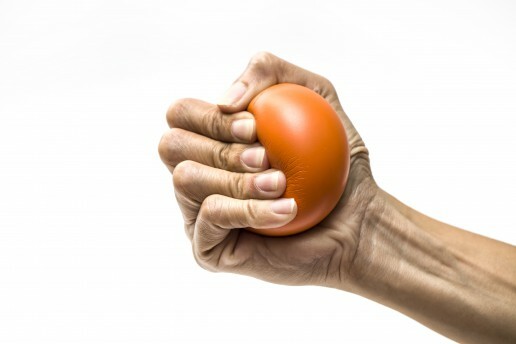 During the current school year, how would you characterize your level of law school related stress or anxiety? Half of respondents reported high stress or anxiety during the school year, 46% reported medium levels, and 4% reported low levels (Figure 1). This means that virtually every respondent reported appreciable law school related stress or anxiety. These proportions are not surprising given the nature of legal education, and it is important to note that stress and anxiety are not always associated with negative outcomes. 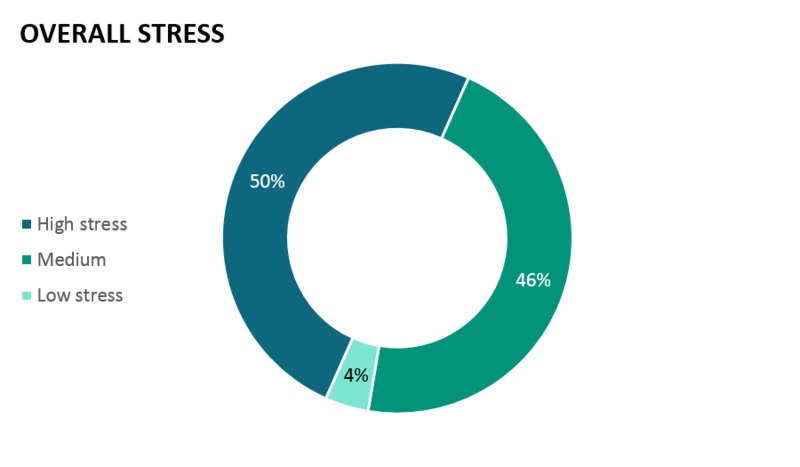 While nearly half of all law students indicated high levels of law school related stress, 3L students reported statistically significant lower levels of law school related stress than either 1Ls or 2Ls (Figure 2). The Law Student Stress Module identified six elements of the law school experience that are believed to be common stressors for students. Using the same 7-point scale, respondents were asked to indicate the extent to which each element indeed caused them stress or anxiety. 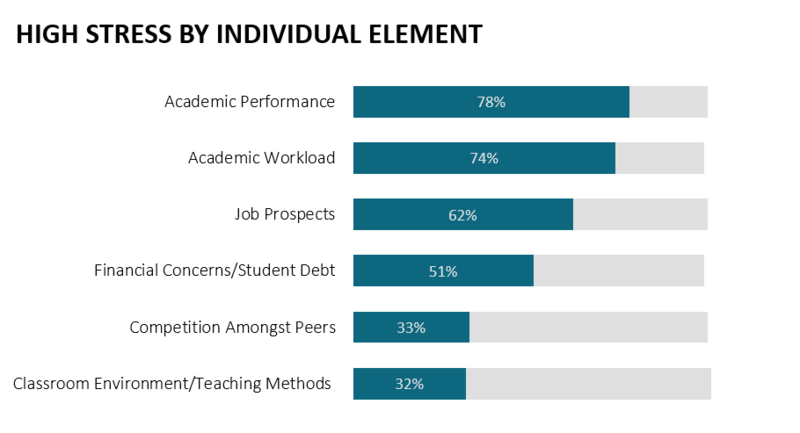 About three-quarters of respondents reported that concerns about academic performance and academic workload were sources of high stress and anxiety. More than half of respondents indicated that concerns about job prospects and finances (including student debt) were sources of high stress and anxiety. About a third of respondents indicated that competition with their peers and concerns relating to the classroom environment (including the teaching methods) were sources of high stress. Stress related to academic performance was more prevalent for 1L and 2L students than 3L students. A similar pattern was shown for stress related to academic workload, competition amongst peers, and classroom environment/teaching methods where 1Ls reported the most stress, followed by 2L and 3L students. Conversely, 3L students reported being more stressed about financial concerns/student debt and job prospects than either 1L or 2L students (Figure 4). 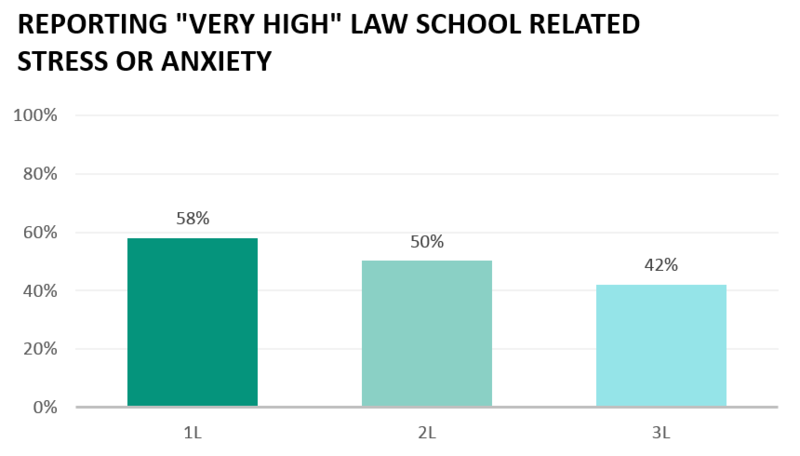 First-year students reported that stress or anxiety impacted their law school performance at higher rates than 3L students. However, 1L students also reported their law school emphasized ways to effectively manage stress greater than 2L or 3L students. First-generation students face a myriad of challenges in higher education. At the undergraduate level, they tend to apply to college with lower admissions indicators (e.g., grade point averages, standardized test scores) than other students, and once enrolled, they tend to persist and graduate at lower rates. The challenges faced by first-generation students have roots in academic, social, and financial realms. The bulk of the research on first-generation students focuses on the undergraduate experience. However, very little research has been conducted on first-generation students who go on to attend law school. Therefore, the data presented in this section explores largely unexamined questions. 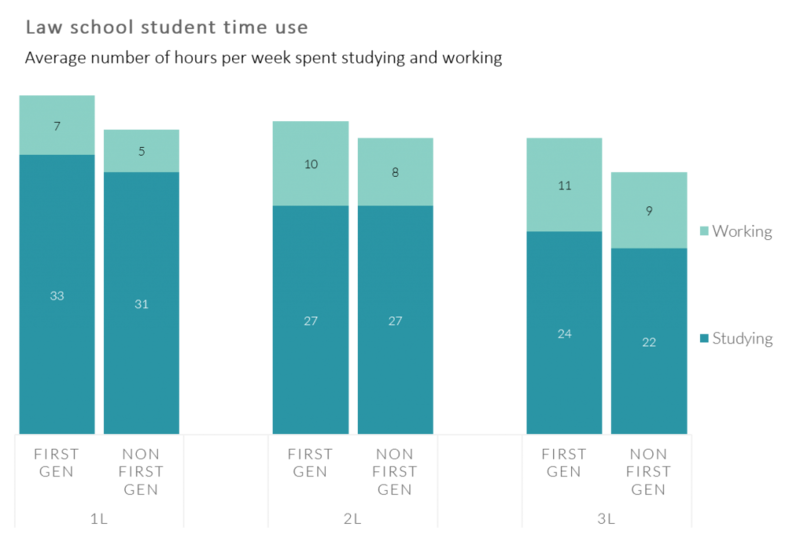 LSSSE 2014 data show that on a number of dimensions, the amount of time that first generation law students spent with peers and faculty outside of class was significantly less than non-first generation law students. Co-curricular activities are critical components of the academic experience. These activities often supplement class discussions and aid in the development of new skills. They can also make students more attractive to potential employers. First-generation students reported lower rates of participation in some of the most prominent co-curricular activities, such as law journal, moot court, and faculty research assistantships. Eligibility for these activities is often determined by law school grades. Differences in time spent studying for class and working for pay could also contribute. First-generation students reported spending about 8% more time studying for class and 25% more time working for pay, compared to other students. The disparities in time spent studying are greatest in the latter years of study. First-generation 3Ls reported spending 8.5% more time studying than other 3Ls. Disparities in the amount of time spent working are most pronounced in the first year, when first-generation students report spending 40% more time. The actual hours spent do not seem particularly high for either group, but aggregated over the course of the school year, the additional time adds up considerably.